Moana Surf Hostel, it is a traditional Basque house of 1889, recently restored, keeping its stone walls and wooden structures in order to achieve a perfect balance with the modern conveniences and our passion for surfing! The home features 9 spacious rooms on two floors, ideal for couples, families, reunions or groups, and a kitchen where you can enjoy traditional Basque food. It has 10,000 green areas where you can enjoy playgrounds, skate practice, and activities such as yoga or Pilates outdoors. 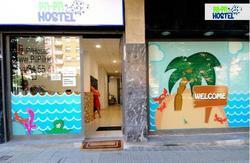 Moana Surf Hostel is located in the Uribe coastline. Located just 4km from the popular beach of Sopelana and Barrika and idyllic mountain surroundings. It is surrounded by natural beauty where to be able to perform numerous leisure activities. Uribe coast is a European and global benchmark in the field of quality surf the waves! Once you arrive at the airport in Bilbao (Loiu) take the local bus company A-3247 Bizkaibus line that connects to the city center. Lower Moyua Square stop once there go to the Metro stop Moyua Square (a few meters from the bus stop). Take Metro Line 1 plentzia direction and get off at metro for Urduliz. From there the house is 1.4 km. If you decide to walk in the direction you need to go down the street to City Hall Gotzon Aita, once you reach the council continues about 10 meters to meet a junction, continue to the right down the street Elortza, about 100 meters'll come to a roundabout and you must continue straight on down the street about 100 meters further on the right to find the street Elortza Auzoa. You go up that street 50 meters and find Moana on the right. From the north and west of the peninsula will have to follow all the instructions to get to Bilbao. When you incorporate you access to the motorway A8 to Bilbao Santander must continue to address. Once we passed the town about 10 km you will find a turning to the right towards Getxo, national plentzia the N647. When you reach a roundabout take the left exit and continue towards Sopelana. Continue straight up through the village of Sopelana. Once you find yourself overwhelmed and need a roundabout take the right exit Urduliz address. Continue straight along this street address Urduliz. Then you must go straight up through the center of town to reach the village of Aita Urduliz Gotzon the street, once you reach the council continued about 10 feet to meet a continuous crossing right Elortza the street, about 100 meters 'll come to a roundabout and you should continue straight on down the street about 100 meters until you find the right with Auzoa Elortza Street. You go up that street 50 meters and find Moana on the right. You will take direction from the highway A8 Bilbao. When you are at about 10 km from Bilbao must take a detour to the right direction for national Getxo N647. When you reach a roundabout take the left exit and continue towards Sopelana. Continue straight up through the village of Sopelana. Once you find yourself overwhelmed and need a roundabout take the right exit Urduliz address. Continue straight along this street address Urduliz. Then you must go straight up through the center of town to reach the village of Aita Urduliz Gotzon the street, once you reach the council continued about 10 feet to meet a continuous crossing right Elortza the street, about 100 meters 'll come to a roundabout and you should continue straight on down the street about 100 meters until you find the right with Auzoa Elortza Street. You go up that street 50 meters and find Moana on the right. You have to reach Central Station Bilbao (Termibus). From there take the Metro Line plentzia direction and get off at metro for Urduliz. From there the house is 1.4 km. If you decide to walk in the direction you need to go down the street to City Hall Gotzon Aita, once you reach the council continued about ten meters to meet a continuous crossing right up through Elortza Street, about 100 meters'll come to a roundabout and you should continue straight on down the street about 100 meters further to the right to meet with the street Elortza Auzoa. You go up that street 50 meters and find Moana on the right.